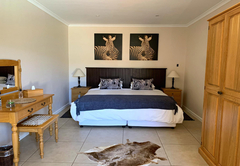 Valid 1 May to 31 October 2019: 15% discount on Cottonwood Suite - Poolside Queen, Garden Room - King, Oakwood Suite - Poolside King/Twin and Oregon Suite - Poolside Queen. 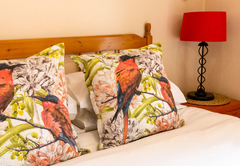 Makapa Lodge is a highly recommended Fish Hoek Bed & Breakfast providing accommodation in 5 guest rooms for tourists visiting the False Bay region. Nestled against the mountain and bordering a nature reserve, Makapa Lodge is situated in Capri Village with a glorious view of the Atlantic Ocean and Chapmans Peak Mountain. 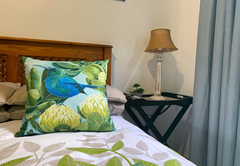 Positioned on the Cape Peninsula mid way between the Atlantic and False Bay coasts, we are only a short drive to the beaches at Fish Hoek, Kommetjie, Noordhoek and Simonstown. 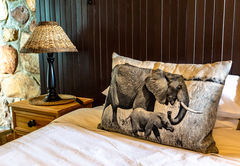 Makapa Lodge offers luxury suites and a comfortable self catering chalet. 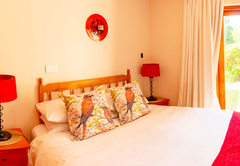 Our accommodation is in quiet, safe surroundings, only 35 minutes from Cape Town city and 45 minutes from Cape Town International Airport. 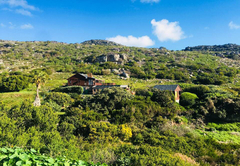 We are ideally located for Cape Point Nature Reserve, Boulders Beach with its famous colony of African Penguins, Constantia and other wine routes, Kirstenbosch Botanical Gardens, and many other areas of interest. 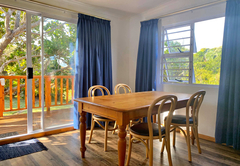 Horse riding, bird watching, mountain walks, surfing and golf are all close by. 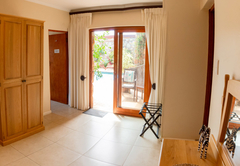 The pool side suites lead out to the solar heated swimming pool which is sheltered and sunny. This lovely outdoor area is ideal for relaxing and sunbathing. All suites have their own private patio areas. 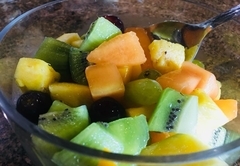 The lodge has secure parking within the fenced property which has access controlled gates. 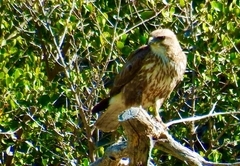 The beautiful, large landscaped garden with its pathways and seating areas, beckons guests to wander through and survey the indigenous plants and local birdlife. The Oakwood Suite, The Oregon Suite and The Cottonwood Suite all having three rooms and two private patio areas. 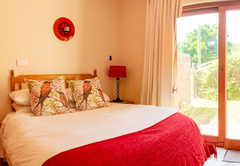 The Garden Room – a large comfortable double room with flow-through bathroom and shower room. 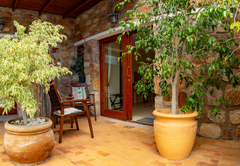 It’s rustic front patio area is set within the garden. 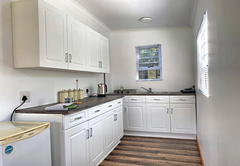 The Nest - a fully equipped self-catering chalet with own private garden and patio area. 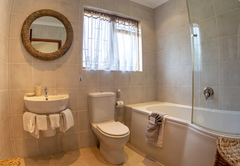 Named after the locally made solid wood furniture the suites are tastefully decorated comprising of separate lounge, bedroom and ensuite bathrooms. The lounges have comfortable armchairs, coffee table, writing desk, a well stocked mini bar and TV. 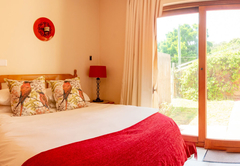 The bedrooms have double wardrobes and dressing tables. 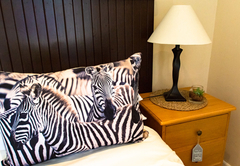 The Oakwood Suite has twin beds; the Oregon and Cottonwood have queen size beds. Electronic safes are provided. The bathrooms all have baths with shower. 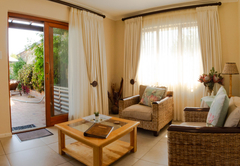 All suites have two private patio areas, with access to the beautifully landscaped garden and the swimming pool. 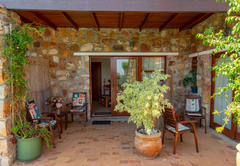 A large room with natural stone walls and wooden panelling, situated snug in the garden with a view of Chapman's Peak mountain. 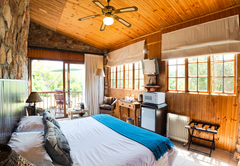 It has warm pine furniture, a king size bed and a comfortable seating area. 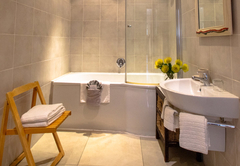 The bedroom leads into a luxury bathroom with stand alone slipper bath and separate shower room. The lounge area has a mini bar, tea and coffee making facilities, a TV and an electronic safe. 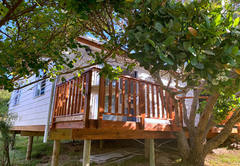 Outside is a small deck with rustic patio furniture. This room is popular with honeymoon couples. 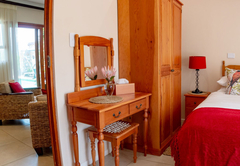 This is our only self catering unit and sleeps a maximum of two. 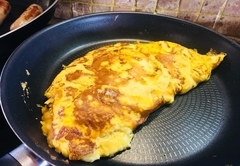 It has a fully self-contained kitchenette and a dinette. 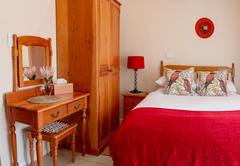 It is furnished with a double-bed, wardrobe, drawers, wicker chairs and has a TV and electronic safe. 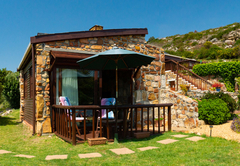 The Nest has its own secluded section of garden with braai and has lovely views of the sea and mountains. 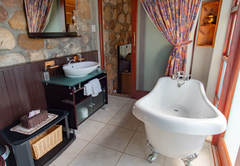 Poolside Queen Suites comprise separate lounge,bedroom and bathroom. Two outside seating areas with views of the pool, mountains and fragrant garden. 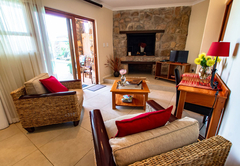 Furnished with comfortable armchairs, coffee table, complimentary tea/coffee and DStv. 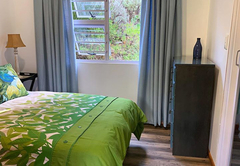 Room with natural stone walls, double aspect view of garden having a king size bed, ample storage, comfortable seating, complimentary tea/coffee, fridge and DStv. 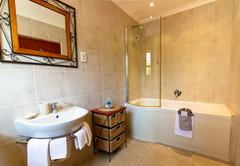 This room leads into a luxury bathroom with stand alone bath and tall walk in shower. 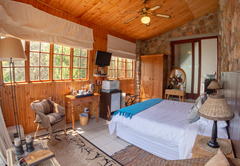 Self catering log-cabin the "Nest" is privately situated with lovely views of the ocean and mountains. 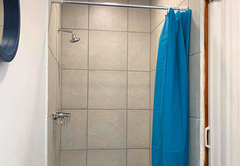 It has a fully equipped kitchenette, dinette and bathroom - hand held shower. It has a double bed, drawers, wardrobe, fridge and a TV (SABC). 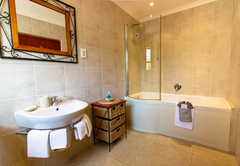 Poolside suite comprises lounge,bedroom and bathroom - shower over bath. King or twin beds. 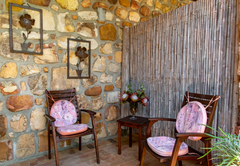 Two outside seating areas, one beside the pool and the other in the garden. 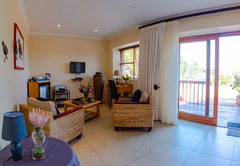 The suite has DStv, fridge,complimentary tea/coffee & electronic safe. Lovely setting, stayed out of season but the accomadation is first class and the pool looks so refreshing. I would stay again if I visit the Cape Town area. Response timeMakapa Lodge typically responds to requests in 5-10 minutes. 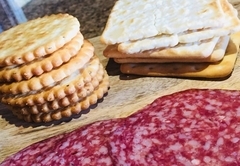 Exceptions to check-in/out times may be arranged, please enquire. Please advise us if you expect to arrive before 14h00 or after 18h00. Special arrival and departure times to fit in with your travel arrangements will be accommodated to the best of our ability.